Over my years of teaching I’ve probably used Google image search about 10,000 times. I like to create a lot of my assessments and worksheets from scratch, so I’m constantly searching for that perfect photo or piece of clip art to illustrate something. But as others in the bloggossphere like Dan Meyer have pointed out, using hokey clip art in this age of giga-pixelated multimedia is inexcusable. Using videos in the place of clip art leverages the engaging and real-world qualities of a video clip, and encourages students to see the science in real life. So, this year I’m going to experiment with video assessments. The idea behind a video assessment is that students will watch a video and then explain it demonstrating their scientific understanding (as a side note- videos could also be used to great effect for introducing a new concept, or could even be made by students themselves to demonstrate understanding- but this is for another post!). The inspiration for this came from Greg Schwanbeck and his post on dy/dan a couple weeks ago. In the comment thread one of the teachers asked about the logistics of doing a video assessment in the classroom, and it is a little tricky. After all, you want students to be able to watch the video at their own leisure, and go back to a certain part if they want. Anyway, I gave this some thought, and I’ll share with you my prototype Video Assessment 1.0 for your critique: click here to check it out. The assessment is admittedly simple- I’m just reworking a pre-assessment that I give to my second graders at the beginning of their unit on Forces and Motion. What I’m looking for as a teacher is to see whether they can identify the kinds of pushes and pulls acting in each video, and whether they are familiar with their scientific names (friction, gravity, etc), and any misconceptions they hold. I would also like to include a clip with magnetic force, but try as I might I couldn’t find a good one, so I’ll probably just have to film one myself. The webpage for the assessment was made using GoogleSites, which allowed me to embed the questions from a GoogleForm that I created (both of these Google tools are free, and I highly recommend using GoogleDocs if you aren’t already). 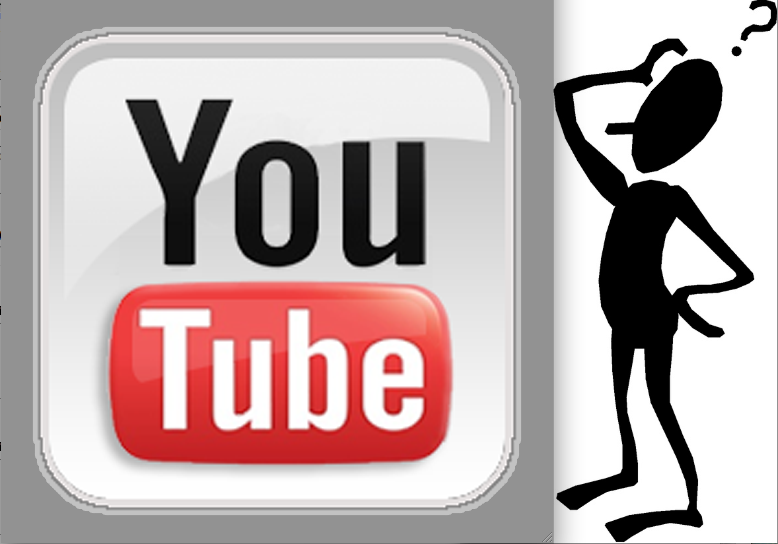 There is an option to embed videos from YouTube directly, but because I wanted to resize the videos to make them fit together tightly on the page, I first ripped them from YouTube using this website and then uploaded them to GoogleDocs in the GoogleVideo format, which lets you resize them. The cool thing about using GoogleForms for an assessment like this is that when students click “Submit”, their responses are automatically collected in a spreadsheet for you. I work with seven 2nd grade classes at my school, so this is a very seamless way to collect a lot of data. All I’ll need to do is simply send the link of the assessment webpage to teachers so they can share with their students. By using laptop carts and headphones, each student will get their own laptop so they can do the assessment on their own and watch the videos as many times as they need. One design issue I have is that I would prefer to place each video directly next to the question, but GoogleForms doesn’t allow for embedding videos. So students will have to do a lot of scrolling up and down between watching videos and answering questions. Anyway, we’ll see how it goes down- but in the meantime I would appreciate any constructive criticism you have. Last year I was lucky enough to receive a grant to build an outdoor classroom at my school, so throughout the school year I’ll be brainstorming ways to make the most of this new learning space. Living in the hot and urban environment of Doha, Qatar, my students don’t have much experience with the outdoors, so I think there’s going to be a ton of opportunities for learning across many different disciplines. One outdoor classroom project that I’m working on right now is the Human Sundial. It’s similar to the boring old sundials you’re probably familiar with, except that it’s your shadow, and not some little stick’s, that points towards the correct time. Another cool feature of this type of sundial is that it corrects for the change in shadows over the course of the year. For those interested in details, this kind of sundial is technically known as a analemmatic sundial; the analemma is the name of the shape created by the apparent movement of the sun’s location in the sky over the course of the year. In this post I’ll explain the nuts and bolts of how to make one of these yourself (it’s not hard- I just did it this afternoon! ), but first I want to share some ideas for how I’m going to use this as a teacher in (whoops- I mean outside of) the classrom. 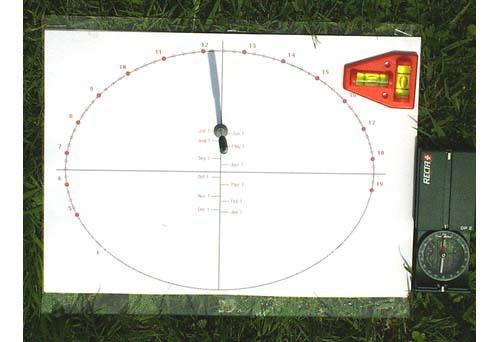 Any time a teacher has a cool tool like the human sundial, there’s the danger that you assume students will just somehow “get it” when you show it off in some classroom demonstration. Even if the demo has a wow-factor, more often than not students will leave remembering the phenomenon, but not the un-wowing explanation that follows it. So how to prevent this? First of all, I’m not going to show the students the sundial right away. That would be like starting a mystery movie by revealing the culprit in the first scene- boring! First I want students to discover how tricky telling time with the sun actually is. With my kindergarten students, who are mostly focusing on shadows, we could begin by just tracking the shadow of a stationary object (like a flag pole) throughout the day. Maybe have a student mark the end of the shadow every hour, or if we wanted to get hi-tech we could try a time-lapse video. If we have a few classes do this and compare the data, I think the students will readily realize that shadows point in certain directions and have certain lengths at different times of the day. I could then up the ante for comprehension by having a shadow prediction contest (where will this flagpole’s shadow be at 3:30?). The Kgers could then even make their own simple sundial using chalk like I did, and record videos of themselves explaining how it works (assessment, baby!). For my 5th graders, who also have an astronomy unit and learn about the rotation and revolution of the Earth, I’d like them to learn about the whole analemma effect- how then sun’s apparent location and shadows change over the course of the year. It’s safe to assume they won’t have many prior conceptions about this, and probably think the sun’s path in the sky is relatively constant- so I can exploit that misconception for my own devious learning intentions! I plan on installing the human sundial in the outdoor classroom- but without the analemma date thing to stand on. I’ll just mark the spot that works in September so the students will be none the wiser when they check it out at the beginning of the year. As time marches on though, the sundial will get worse and worse at time-keeping, and by January it should be downright awful. This would be a great time to raise the alarm and have the student’s try to figure out what’s going on. To juice this for all it’s worth I’ll need to make sure there are some grade-level appropriate resources out there that they can use though (any help here would be much appreciated). 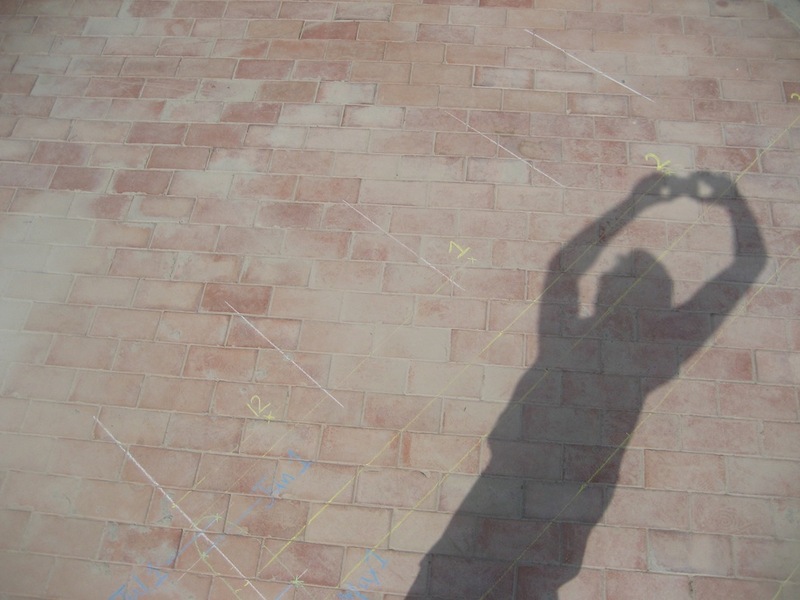 Then I can use their suggestions and introduce the analemma to fix the sundial…. until next year of course! First you need your exact latitude and longitude. You can use a GPS for this, or you can just go to Google Maps, find your location, and then right-click on it and select “What’s here?”. This will place a little green arrow on your location that you can hover over and get the latitude and longitude. It leaves it up to you to figure out if you’re North or South of the equator and East or West of the prime meridian (good luck with that!). You also need to know your time zone (how many hours plus or minus Greenwich mean time), and whether you’re currently having daylight savings time. Since Qatar doesn’t bother with daylight savings, this doesn’t affect me, but it will require some alterations to your sundial if you are in a place that does. Make sure your sundial location is level. You could use one of those bubble-in-liquid carpenter-thingies to do this, or you could do what I did… take a look at your space and say “Looks pretty level to me!”. Then you need to find true North. No, you can’t use a compass because they point towards magnetic North. There’s a variety of ways to figure out true North, but I think the easiest method is using Solar Noon (when the sun is at its highest point on the horizon), because all you need are some household supplies to make a straight shadow at the time of Solar Noon. Here’s a good explanation of how to do it. Don’t feel like you need to go get all the construction materials though- I hung my weight off an overhead car shade and just traced the shadow with chalk on the pavement. Once you have a true North/South line set up, then you can start setting up the sundial. To get an idea of what the finished product will look like, I recommend checking out the applet on this website which draws the analemmatic sundial for you when you input the above info (see picture below). You can actually print this out and use it as a mini-sundial as well, just make sure to line it up with your true North/South line. So far so good? Now on to the human-sized sundial! The math for creating one of this sundials is pretty complicated, so to avoid crunching the numbers yourself, you can use a spreadsheet like this. This spreadsheet might seem a little daunting at first, but the only info you need to input is the cells in blue on the first sheet. Besides the info above you’ll also need to find out your time zone meridian which is the middle longitude for your time zone (you can find this on the picture here, just look at the longitude number above your time zone- for example Qatar’s time zone is +3 so the meridian is 45 degrees East). Finally you need to input the gnomon height, which is simply the height of the thing casting the shadow- you! When the spreadsheet spits out your numbers, just check the pictured sundial on the sheet called “Layout” and make sure it’s identical to the mini-sundial made by the applet. If it is, you’re ready to start building the real sundial. Start by creating an origin point (like 0,0 on a graph) somewhere in the middle of your true North/South line. Then it’s just like making a giant graph- use the x and y coordinates to plot the hour markers, and the x and “date point Z” coordinates to plot the dates. I did mine in chalk first on the pavement to check if it actually works. Taken just after 2pm. Boo-ya! For more information on how you can use a human sundial for some great learning activities, check out my follow-up post here. Teaching students to become “life-long learners” is a popular buzzword bandied about in education. Despite the tiredness of the term, getting students to realize that learning doesn’t just take place within the confines of school and homework assignments is a real challenge (illustrated well in this Think Thank Thunk post). How can we inspire this life-long learningness from an early age? To measure the success of this venture I’m using Google Analytics, which will give me detailed data about how much the site is being used, how many unique visitors are coming, and whether they’re accessing the site from school or at home (by the way, Google Analytics is also free- so have you started making your own website yet?? :). Throughout the year I’ll add various “attractors” to the site such as photos from field trips, resources for assignments, and videos from class, as well as directing parents to the site whenever I get the “How can I help my child?” question (a tough question to answer when you can’t just point them to a textbook). I also feel like there’s an opportunity to integrate social media into the site some way (student comments, polls, etc), which could broaden the usage of the site. In my previous school I had my 5th grade students create their own websites about their science fair experiments on the kid-friendly site ThinkQuest and I was surprised to see how the ability to leave comments on fellow student’s site generate a ton of buzz (not always of the learning kind of course, but variety is the spice of life). So I’d appreciate any suggestions from folks who have experience in this department. Predictions? Will simply putting resources out there for students be enough to inspire extended learning outside the classroom? Since my students are fairly high-achievers with involved parents, I have high hopes. Then again, I suspect a website like this will mostly be used by… high-achievers with involved parents, but not reach the students who need some life-long learningness the most. But we’ll see! Then there’s the issue of how much students visiting the site actually leads to life-long learningness (or learning of any kind for that matter!) I don’t know how I could measure this exactly, but I plan to do as much anecdotal research as I can by asking students and parents how they are using the site, perhaps even conducting some polls. Overall though, I believe that encouraging an interest in learning on your own time (whether it’s reading a book about science, trying an experiment at home, whatever) will have an impact. In my own childhood my parents were careful to surround me with educational diversions (Oregon Trail computer game, science encyclopedias, trips to museums) and these clearly rubbed off. Hopefully creating a virtual version of this for my students will have a similar effect. You can check out the website I’m creating here, but it’s mostly just a framework now- I’ll be adding content as the year progresses. I would be interested to check out sites that other teachers have made, particularly ones intended to extend learning beyond the classroom. Anyone got some of that out there? My 3rd graders will be starting of the year with a unit on sound and light, which has always been one of my favorites (so much to play with and observe, and so obviously relevant to students’ lives). The sound part of our unit is pretty heavily based on the FOSS unit Physics of Sound which many teachers are probably familiar with. However, there appear to be some changes coming down the pipeline with the impending national science curriculum and this summer’s release of the K-12 science framework from the NRC (for a primer on this, check out this article from Education Week) The new framework has a new approach to physical science standards that could change the emphasis of units like mine. 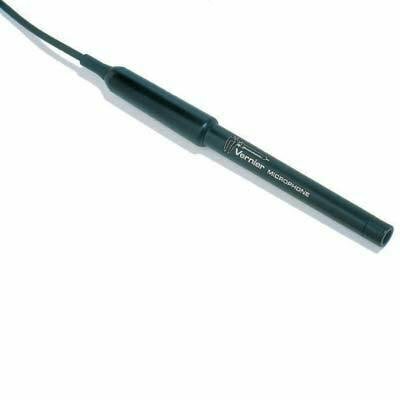 Get a sound microphone probe, such as the one sold by Vernier at right. No need to buy one- I borrowed one from my high school physics department, so ask there first. You’ll also need to borrow the software that goes along with the probe to graph it’s output, for example Logger Pro . Now it’s time to play- get the probe set up to collect data, and put it near an instrument that can create pure tones (a electronic keyboard works well, especially on a setting like “Whistle”). Start collecting data and playing your instrument, and you should see the data graphing from the probe. It will look like a mess at first- so stop recording and play with the axes of the graph. You’ll need to stretch out time on the x-axis because most audible sound waves will be so packed together you won’t be able to see the wave. Once you’ve stretched out the x-axis enough that you can see a wave (like the one pictured ont the left), now comes the fun part! Start collecting data again, and experiment with playing notes at higher and lower pitches as well as louder and softer volumes. Pretty neat, huh? You’ll be able to see exactly how the sound wave changes- how volume is related to the height of the wave and pitch is related to it’s wavelength (or speed of vibration). Once you’ve got the hang of it, any invisible sound wave can be made visible… which can lead to all sorts of class investigations. I wish I could find an online version of a sound wave visualizer that utilizes a laptop’s built-in mic, because that could allow many students to work with it at the same time. If anyone out there knows of one- let me know! Any other ideas out there? How else can traditional teaching of waves be updated to include modern technology applications? I’m all ears! I’m an avid blog-reader, so I guess it was only a matter of time before I through my own hat into the ring. I’m especially interested in blogs about teaching, where teachers engage in those kind of deep conversations about pedagogy only seems to happen at grad school, and unfortunately not very often around the faculty room water cooler. So far I’ve been fortunate enough to find some stellar blogs that engage these kinds of conversations, but mostly written by math teachers or high school physics teachers (such as Dan Meyer and Shawn Cornally). I don’t know of much out there that deals with K-8 science teaching (but if you blog about this, please let me know!). So this blog is my effort to build the same kind of reflective community for elementary and middle school science teachers, although thoughtful teachers of all subjects and levels are welcome to join in the discussion. Why call this blog the Scientific Teacher? Because it’s more about a scientific approach to teaching than just teaching science. That’s how I strive to approach my own teaching, by applying the scientific practices of questioning, collecting and analyzing data, researching, debating, and above all experimenting with new ideas in the classroom. And I know I’m not the only one out there that does this- I know there are tons of teachers pushing the envelope out there, but I don’t want to wait until I bump into you by chance at some conference. By leveraging the power of the internet, teachers should be able to communicate with each other to push forward our understanding of teaching and learning in the same way the scientific community does. So let’s do this thing! I’ll start rolling out posts of my own questions, research, and classroom experiments, and if you’re a scientific teacher yourself, I want to hear from you. Too many teachers work alone in their classrooms and too many good ideas never see the light of day- but we can and should change that. So let’s connect and get the conversation started, and who knows- someday we may be able to conduct our own educational experiments across the many classrooms of our online community. Wouldn’t that be cool?